Hiking and photography are one of the most fun combinations one can ever imagine. There are lots of hidden treasures that wait to be explored and their snapshots taken. Going off the beaten paths with your camera is an allure that hikers find irresistible. The diversity of any landscape such as scenic views, deserts, wildlife, rocky hillsides and colorful mountains among others means that your camera should be always be ready to perform its tasks. Otherwise, you might miss the best setting for taking a shot worth thousands of words. As a hiker and a photographer at the same time, you need to be prepared for the challenges ahead. Capturing the amazing night skies, breathtaking landscaped and illuminated tents won’t come easy. These tips for the hiking photographer should be of great help. When hiking, there is a saying that goes like this, “less might be more.” What this means is that it is possible to get the most out of your hiking and photography by packing light. Other than the photo gear you will need, there are other essentials you will need for survival while on the trail. Your packing is dictated on most occasions by the duration you intend on spending on the hike, your travel inclinations and the photography you will be doing. Sometimes knowing what you might need beforehand might be impossible. You, therefore, have to rely on past experiences. Draw up a list of what you carried last time but did not use. You can also write down what you did not carry but you needed to use. Bring along lenses depending on the types of photos to take (don’t bring all the lenses you own). A couple of batteries is a must, cleaning gear and probably a tripod. Whenever you are going hiking, you need to always have the best camera for hiking. However, this does not mean that you compromise on the other gear that you bring along. First of all, do a research on the hiking mountain that you will be exploring. This should be done at least three days prior to the day of the hiking. If you find that it frequently rains up there, then you can bring moisture resistant lenses (or camera). You need also to be aware that weather conditions can change on a dime without notice. Bring along some backup gear just in case it changes from rainy to sunny at a moment’s notice. If you intend on being away for a long while, you should be ready to keep your gear in top shape. The photography gear, in particular, will need a lot of care. They need to be clean, dry and not get cold at any time. You should also regularly wipe the camera parts for proper functionality. You might have brought along the best camera for hiking, but if it gets wet, then it won’t be of much use to you. Packing all your gear properly is the first step in protecting them from the weather elements. Bring along an air blower as well as a cleaning cloth to wipe clean the lenses you may decide to bring along. Then remember to keep the batteries warm as they drain faster when they get cold. Keeping your batteries in your sleeping bag is a great hiking hack for a photographer. As you hike, you are sure to find lots of great spots in which to take a picture. However, such an opportunity might pass you by if the tripod and camera stay stuck on your straps or back. The hassle of getting them out becomes too much. You are then forced to procrastinate and promise yourself to take the shot when on your way back. Sadly, this never happens on most occasions. A better way of dealing with these inefficiencies is using a holster to allow the camera and lenses hang from the shoulder straps. With the tripod (if you brought one along), you should be able to deploy it quickly. Most photographers prefer carrying the tripod over their shoulders to having it attached to the bag. In whichever position you choose, deploying it should be fast and quick. If this is not the case then you might have just left it back home. The company you keep while hiking and taking pictures at the same time determines the success of both. There are certain hiking mates and guides who are intent on climbing the mountain as fast as possible then get over with the activity. Such a hurry will not work for you if you want to take amazing shots in the process. As a photographer, you have to linger about in a scene before finding the perfect angle for a shot. Your mates should, therefore, have the patience to stay with you until you are done. Different cameras have different storage capacities as well as battery durability. On average, a fully charged battery should last you about 500 shots (it could be more or less). This number reduces considerably to about 150 if you are exclusively using the flash. On a hike, you are most likely to take more than these shots. There are lots of scenic scenes that you wouldn’t want to miss out on. If you plan on being out for more than four hours, extra memory cards and batteries are a must. This is unless you do not want to snap some of the stunning sights. A better strategy would be to stop confirming whether you have taken a great shot or not. Looking at the image on the camera LCD screen wastes power unnecessarily. Wait until you are home before you can start going through all your hiking adventures. The allure of taking a picture might overwhelm you so much that you may ignore simple hiking basics. Although most of the photography needs to happen at a moment’s notice, sometimes you simply need to create your own luck to take a great picture. Doing a prior research on the spots where great shots can be taken makes the process a lot easier. By doing this, you can plan out your framing as you walk. With this in mind, go back to photography basics: Point and Click. Do not attempt anything too crazy. You should not be the type of hiking photographer who loses their cameras while on a trail. Cameras falling into streams, onto rocks or lenses scratching are common as one attempts those crazy shots. In as much we wouldn’t want you to lose any of your gear, we wouldn’t want you to be at the expense of your life. There are numerous photographers who unfortunately pass away trying to push the boundaries too far for a single shot. In any situation, you are more important than any once in a lifetime shot you may encounter. It wouldn’t be of any use if you take it then you miss the chance to enjoy it. Taking photographs while hiking is an ecstatic experience. It helps you remember every step you took while out in the mountains. You can also share these shots with other people to have the same feeling you had. Follow these essential tips for the hiking photographer, and then the next pics you take would be even more incredible. If you want to make the most out of your next camping trip, then all it takes is a little foresight and planning. Sure, over-planning a trip of any kind can take the fun out of it, but just a bit of preparation can result in a much more enjoyable trip for everyone involved. Well, I once heard in a college lecture, “in nature, you find your way to your own truth”. While in college I certainly did not care for nature; it was full of bugs, poisonous plants, and basically everything else Mother Nature has designed to kill you. The idea of sleeping on the ground without showers was not an appealing one for me. Those college days and that college attitude is far behind me, but that quote has stayed with me. Now I love the outdoors. Sure, I am still reticent about big adventures outside because each one seems to come with a unique list of outlandishly expensive equipment that can only be used specifically for one type of activity during one season with one set of weather conditions. However, I have found that there are many ways around some of the bigger out of pocket expenses (for example, you can find outdoor recreational centers that will rent things like sleeping bags and tents), and once you have the basics, you can head out into the wilderness all around the world and access sites and experiences that are inaccessible otherwise. Having camped all over Europe and Africa, I now know that there are many hidden gemstones that you will stumble upon when you plan even a quick weekend camping trip. And while it might be inconvenient to go without running water for a few days, you can certainly get by with a good fire and great friends by your side. So, how do you even start planning your camping trip so as to make the most out of it? Length is a serious concern when planning a camping trip. Every other decision you make will revolve around the length. Are you going to camp overnight, one night and then hike back the following afternoon? Will you be staying at a campsite with facilities or a camping site with running water (cold, of course) for a mere 5 hours per day? How long you want to camp out might influence where you choose to pitch your tent, literally or figuratively. Here is a link where you can find some of the best camping sites around. 2. Book your camping sites. Once you know the length of time, book your camping sites. Most camp sites are supremely inexpensive, especially if you have just a tent. It will run you no more than a few bucks to get access to a personal camp site and maybe some running water and bathrooms. But you should reserve them, especially if you plan to camp in the summer or at a popular national park. Some national parks fill up months in advance. Obviously you can review those sites with services (like running water and showers and maybe even an on-site restaurant) and those without. Figure out what your plans will be. Are you going to camp at the same site near the French and German border so that you can hike to different castles each day but return to base camp at night? Are you going to make your way along a stretch of the California mountain ranges and camp out at different areas each night? Is your plan to see certain things, hike to a famous bouldering point, or just reach a mountain peak and take in the view? The activities you plan to do impact the equipment you will need. If, for example, you want to stop at a famous bouldering site, you might need to pack some special shoes and chalk. 4. Start chipping away at that equipment list. You will need a lot of equipment, based on where you are camping and for how long. If you plan to drive to a campsite and then pitch your tent, then you do not need to worry about weight or fitting everything into your backpack. After all, you can just fill the car with any extras. If you are going to take a bus or train to the start of a route and hike to your camp ground, then you will need to make sure you have everything in your backpack, and that your backpack does not knock you over with its weight. What things might you need? Once you how long you will be camping and what type of campsite, you need to pick a tent. There are many schools of thought regarding camping tents, and obviously the size or shape you get is contingent upon many factors like whether you are camping with your family, whether you are hiking to your campsite so the tent needs to be lightweight and compact, etc… Take a look at this review from REI on different types of tents so that you can make an informed decision here. After all, if you are not comfortable during your camping adventure, you won’t get sleep you desperately need in order to make the most out of every other aspect of your adventure. Like tents, there are many types of sleeping bags for different scenarios, so read this review to find out more. Camping cookware is really quite neat because it can fold down into a compact container that has everything you might require. Now, if you are going to build a fire and make your own food, then you will need a burner and some fuel to go with the cookware, and of course, food. You will need a water vessel of some kind, which is really contingent upon the length of your camping trip and where you will be. Some sites have access to clean water, so you can just bring a water bottle or camelbak and refill it. In Yosemite, the water stations are clearly marked and each hiking trail will tell you how much water you should have on you and where you can refill. This is something you should invest in and keep in your backpack always. The more comprehensive, the better. Keep things in there for bee stings, allergic reactions, minor cuts and scraps. You do not want to get stuck after dark without a light. You might need it to wander over to the campground facilities too. Depending on when and where you are camping, you might want to bring this in case the water turns. Camping toilet paper that will decompose, in case you are out of facilities but need to go. With all of that done, you are ready to go. Get out there and start enjoying your next adventure! If you’re spending a day outside, one of the best things you can bring along is a pop-up canopy. Canopies serve as a central base camp for your group, offer cool shade if it gets too hot and sunny, and can be the difference between getting soaked and staying warm and dry if the weather turns sour. Compared to tents or more rigid structures, pop-up canopies offer unparalleled versatility since they can be easily transported and offer plenty of space for multiple people and stuff. When it comes to canopies, there are a ton of choices out there – and you want the best pop-up canopy for your adventure. We’ve looked through the pack to find the best pop-up canopies on the market to make the choice easy for you. There are a few key factors to weigh when choosing the right pop-up canopy for you. The most important question to ask yourself is where you’re likely to use it the most. If you’re headed to the beach, look for a heavier canopy that can stand up to wind and offers sidewalls to protect from late afternoon sunlight. If you know you have a long walk to your destination and aren’t expecting heavy winds, you’ll be better off with a lighter canopy that offers a more slender frame. Other canopies offer additional features, like bug nets, LED lighting, or windows. These can be great for specific uses, like camping or formal events, but add to the cost and weight. Finally, consider ease of setup. A canopy may be packed with features, but if the design makes it hard to go from carrying case to relaxing in the shade in less 10 minutes you’re not likely to use it. With those guidelines in mind, here are our picks for the ten best pop-up canopies. The E-Z Up Sierra II is one of the fastest canopies on this list to set up, thanks to the straightforward design that allows you to simply pull the legs apart and then push them up to raise the canopy. With two people, you can have it up in under a minute, and even solo it’s relatively easy to get the Sierra II setup. The quick turnaround makes it perfect for tailgating, since you’ll be able to put it up and take it down quickly if you’re running late for the start of the big game. Even better, the Sierra II features a vaulted canopy that allows for plenty of head space when standing up and readily ventilates smoke if you fire up the grill under the canopy’s shade. Just be aware that you’ll want to use tent weights or place cement blocks on the feet in windy weather – the Sierra II is also one of the lighter canopies available, and the extra high canopy can easily catch a gust. Abccanopy hit all the right notes with their Kingkong canopy. The defining feature is how sturdy this canopy is – unlike most pop-up canopies, the Kingkong will stand up to 20 mph winds thanks to its burly frame. The joints are reinforced with metal brackets, preventing the legs from buckling when hit with a gust and adding to the overall durability of the canopy. 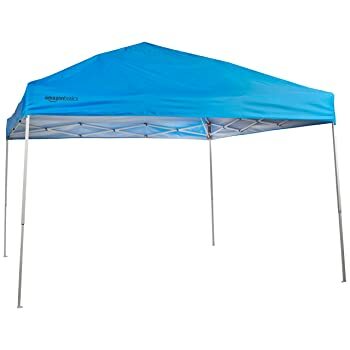 In addition, the canopy itself uses a waterproof fabric and attention was paid to sealing all the exposed seams so that it won’t leak even in the most drenching downpour. While it can’t be set up by one person alone, setup for the Kingkong is straightforward and fast for two people working together. You’ll want a second person to help carry it in any case, since all those protective features add a substantial amount of weight. Perhaps the best part of all is that the Kinkong comes in your choice of more than 18 vibrant colors! If you’re looking for something more than just a canopy, the Back Home may be just the ticket for you. This pop-up canopy mimics the best features of an enclosed tent, but without the fuss of assembling poles and the cramped space that doesn’t allow you to stand up. 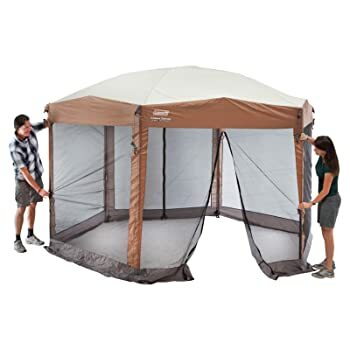 The screen wraps all the way around the canopy, and can either be zipped in the front to keep bugs out, tied back to allow easy entrance like a gazebo, or removed entirely if you want to mimic a traditional pop-up canopy. The canopy itself is simple enough to set up that a single person can tackle it, although because of the added work of Velcroing the mesh screens onto the panels it does take a few minutes. The only people who might have a problem with the Back Home are pet owners – dogs and cats can easily put holes in the delicate mesh if they bite or scratch at bugs on the outside walls. For vendors at outdoor shows, the Eurmax Ez Pop-up Canopy has everything you need. The carrying case is equipped with wheels, making it easy to transport the canopy from your car to your booth space. 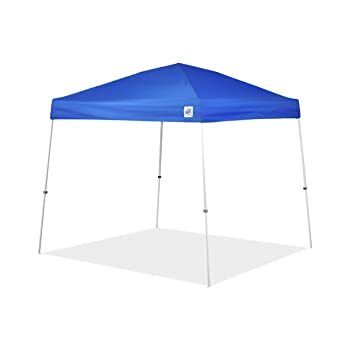 Unlike many pop-up canopies, this one comes standard with sturdy sidewalls that can be quickly attached with Velcro and then fastened to the frame so they don’t blow around. The front panel even has an integrated window and door, giving you additional options for guiding the flow of customers into your booth. And Eurmax stays one step ahead by providing covers for that window and door to help protect goods left inside your tent at overnight shows. 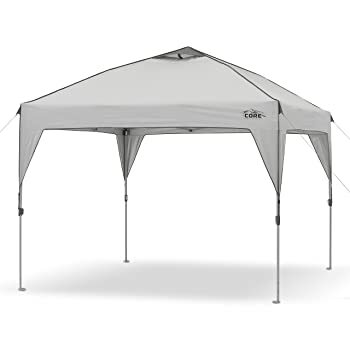 In addition, this canopy will protect you and your wares from rain and wind since it features waterproof and seam-sealed fabric for the canopy and sidewalls and comes standard with a set of tent weights. For those who like to add a personal flair to their booth, this pop-up canopy also comes in a variety of attractive colors. Quictent’s Outdoor Gazebo strikes the perfect balance between formality and utility for upscale outdoor parties like a wedding reception. The canopy is twice the length of the standard 10’ x 10’ canopy, allowing it to house a long buffet or drinks table as well as tables for guests to sit at. That makes a big difference in rainy conditions, since putting two smaller canopies side-by-side inevitably leaves a gap where water drips in. 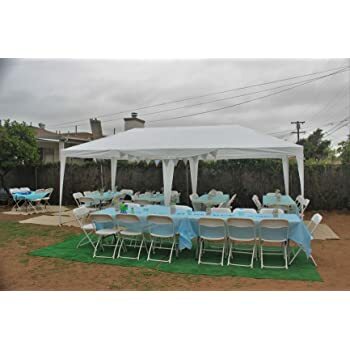 In addition, the removable sidewalls feature stylish arched plastic windows that make this canopy look good even for the most upscale parties. The only downside to this tent is setup – unlike pop-up canopies that utilize sliding legs, the Outdoor Gazebo uses numerous steel tubes that have to be assembled and disassembled and requires multiple people with a knack for patience. That said, this canopy stands out among others using this framing mechanism because it uses wide-diameter, rust-resistant tubes that are significantly more durable and less likely to bend than the narrow poles used by competitors. Abba Patio designed this canopy to be portable, but it really shines as a fixed-placement shelter such as to cover a boat or car. The feet are designed so that they can be bolted in place to wood or concrete, and once that’s done the canopy can withstand gusty days without issue. Unfortunately, the canopy itself isn’t made from waterproof fabric, but that oversight on Abba Patio’s part can easily be fixed by applying an after-market waterproofing spray. In the winter, simply throw a tarp over the canvas to protect it from the elements or quickly remove it using the easy-to-use bungee system that holds it to the frame. Perhaps the best feature of this canopy as a permanent shelter is that, unlike many pop-up canopies, it is pretty to look at. The canopy is made from polyester, but imitates the look and feel of canvas to give the shelter a homey feel. Ohuhu’s Instant Shelter does many things right and is one of the best all-around canopies on this list for those looking for portability and ease of use. 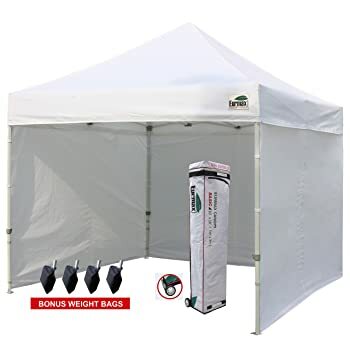 First, the frame is lightweight and comes with a wheeled carrying case, making it easy to truck this canopy long distances from your car to the far side of a soccer field. 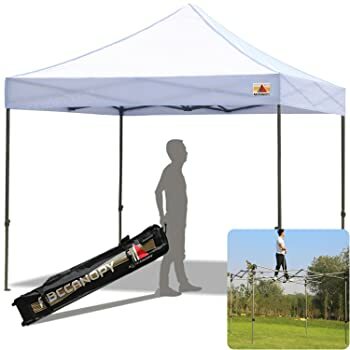 Once there, the canopy can easily be setup by one person in just minutes. Perhaps the best feature on this canopy is the highly adjustable legs, which allow you to lock them in at three different heights. That means that you can angle the canopy to protect from sun, wind, or rain at your back while still enjoying unobstructed views of the game in front of you. Angling the canopy like this can also help to prevent it from flying away in high wind conditions, since like many lightweight canopies the Instant Shelter is prone to catching gusts. What sets the CORE Instant Shelter apart from the competition are the two integrated ventilation panels built into the canopy. On especially hot days, most pop-up canopies will not only provide shade, but also trap heat. CORE’s canopy solves that problem by giving that heat an easy escape route, keeping you cooler. 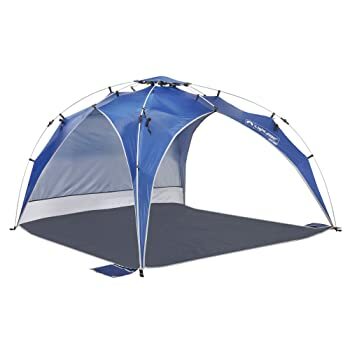 This tent also uses a stretched canopy design, connecting the canopy to the bottom of the legs. The advantage of that is added wind protection, since this design keeps the canopy taut and prevents it from billowing with even moderate breezes. The downside is that this design can make setup slightly more difficult, since there’s less room for error when extending the legs. However, with two people this canopy still takes less than 10 minutes to set up. Add in a wheeled roller bag to get this canopy onto the beach, and this canopy is a solid option for hot days that call for extra ventilation. If the forecast is calling for wind, this canopy will hold strong where most others would fly away. The frame is constructed of extra thick steel and the canopy is made from thick, burly fabric. 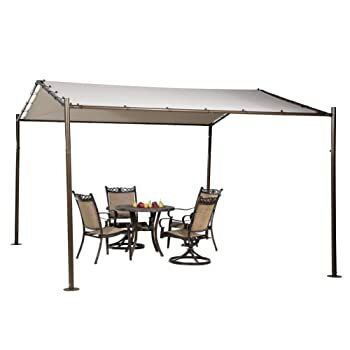 That heavy-duty construction adds weight, but it also makes the canopy much more stable in high winds and more durable overall. 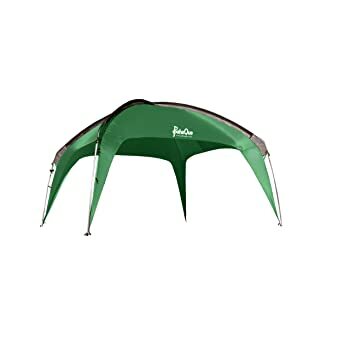 In addition, four tie-in points are stitched into the canopy and the tent comes with cord and stakes. This enables you to tie down the canopy, stretching it taut and keeping it from moving in even severe gusts. Finally, the canopy has an air vent near its apex, which allows wind to circulate through the canopy rather than catch it and blow the tent over. 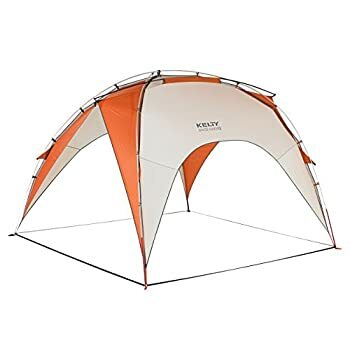 Of course, setting up the tent in windy conditions can be difficult and time-consuming, so you’ll want to be prepared with at least two people and plenty of patience for this canopy. 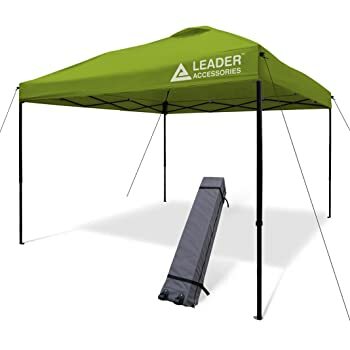 Added bonuses to this canopy are that it comes in five different colors and sidewalls (which utilize an extremely sturdy fastening system) can easily be added after-market. If you’re looking for one canopy that does a little bit of everything and is light and easy enough for one person to set up, AmazonBasics canopy may be just what you need. This canopy is stripped of many of the features seen on other canopies on this list – there are no sidewalls, no vents, the frame is relatively thin and light, and it only raises to a single height. But, it’s also one of the lightest and cheapest canopies we’ve reviewed and it comes in a wheeled carrying case. All of this makes it easy to take it nearly anywhere you want it to go, without the need to worry about damage. The design is simple enough to enable a single person to take this canopy from carrying case to upright in minutes. For especially windy days, the canopy’s design allows for the included stakes to be pushed through the feet. Unfortunately, there is no Velcro on the canopy to allow for sidewalls to be added – but for those looking for a simple design with a lightning-fast setup, sidewalls would only complicate the canopy. There are a seemingly infinite number of pop-up canopies available, but these 10 strike the perfect balance between ease-of-setup, durability, and functionality. Whether you’re headed out on a sunny, calm day and just need some shade, trying to stay dry in a downpour or keep the tent from blowing away in high winds, or just need a central location for your outdoor gathering, these canopies will get the job done. Get outside with a pop-up canopy and start enjoying your adventure without worrying about whatever the weather might throw at you! 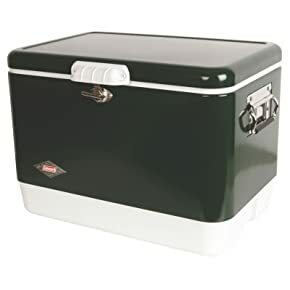 Since tents, fishing boats, and SUVs do not have refrigerators in them, it is important to have the best cooler or ice chest to keep your food safe and cool. There are plenty of options that will work, but deciding what is the best cooler can be difficult. This is why we are here, so show you the best coolers and ice chests for your camping expeditions. We have tested them in the field so we can tell you all about the features that we love the most. The size of the cooler that you choose can make a big difference in your camping trip. There are several sizes to choose from and they are all useful for different purposes. Some coolers are great for a small camping trip on your own, while others can be heavy to tote around and need a few hands to get them from the car to the site. The small camping coolers hold 25 quarts. 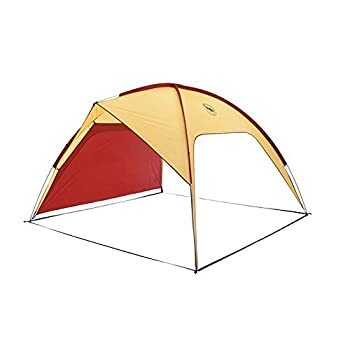 These are not usually the best for a large party, but they can be useful to keep in an individual tent if you are camping with a big group. They are also good choices for campers who like to go out on their own. The next size up is the medium cooler. These carry up to 45 quarts and can be useful for three to five days or a long weekend. They can get heavy if loaded with ice and glass. Finally, the large camping cooler, which can hold up to 70 quarts is the best option for a long camping trip. Unfortunately, these do require a lot of ice to keep the items inside cold for the long haul. These are ideal for families who take camping trips for a weekend or for several weeks. They are versatile, but they can be very heavy. Another important feature of the best camping coolers is strength. The wilderness is full of animals and in some cases, those animals are bears. The best coolers can withstand bears. 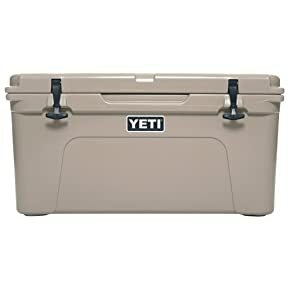 This type of cooler is called a grizzly cooler because they are strong enough to stay closed, even in the event of a hungry bear trying its hardest to get the lid open. These coolers will certainly keep your food cold and the ice inside. Along with protecting your food, a grizzly cooler will also keep the bear safe and it will keep other campers safe. Some people keep non-food items in their coolers and bears can be harmed by eating non-food items. And, when bears get into one cooler, they will look for more to open – which puts other campers at risk. There are actual certifications that show how strong coolers are when it comes to grizzly bears. The Interagency Grizzly Bear Committee certifies coolers. They actually test them to see if grizzly bears can into them and whether or not the coolers will be safe to use in the wilderness. If a cooler has a IGBC certification, then you know it is one of the best in the industry. When you shop around for your cooler, it is helpful to know how long the ice will last. If the cooler is repeatedly opened and closed, then the ice will not last very long. But, a cooler that can be pre-chilled will keep the ice nice and cold for much of the trip. The best coolers will maintain ice for days. Durability is another important feature for a camping cooler. They usually sit outside in the elements, so they need to withstand the rough ground, wind, and rain. They need to have rugged bottoms and wheels because they are usually dragged over gravel terrain. No one wants their cooler to fall apart while out in the woods. A good cooler also has handles that can take the weight of the contents. Coolers can become quite heavy when fully loaded with ice, drinks, and food. The best coolers have handles that make them easy to carry. Many of the best coolers also have wheels and tall handles like carry-on luggage. It is important that coolers will stay closed when they are being carried or wheeled around, too. One of the most recognizable names in coolers is Igloo. 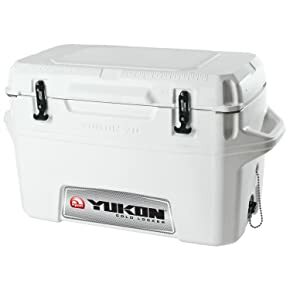 The Yukon Locker Cooler is not the typical Igloo cooler. This cooler is huge and it is built to last. It is one of the best for keeping food on the inside because it has dual lid locks and the polyurethane insulation is three inches thick on the lid and two inches thick on the body of the cooler. Nothing is getting inside of this cooler unless it has thumbs. This cooler is ideal for anyone who loves to fish because it has a fish keeper scale in the lid. The lid also has a raised and textured work surface, to make it easy to take care of the fish you catch. Because it is important to be able to keep the inside of the cooler clean, the drain is oversized and the plug is tethered, so you won’t lose it. Igloo developed a technology they call Cool Riser Technology. It is designed to reduce surface contact so the air flows underneath to keep everything on the inside nice and cold. This is considered a large cooler because it holds up to 70 quarts. Because of the high-tech cooling technology, it can keep ice on the inside for up to two weeks. The cooler has built in handles that are extremely durable. 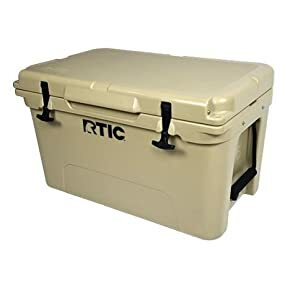 The RTIC Cooler is a great choice for camping, especially if a fishing boat is involved. This medium-sized cooler holds up to 45 quarts and fits perfectly on the floor of a boat or in the back of a truck for a tailgating event. It is also easy to bring along for a camping trip. The RTIC Cooler is nearly indestructible and includes an integrated locking system to keep unwanted hands out of the contents. The heavy-duty rubber T-latches make the cooler easy to open and close. It is small enough that it can be carried by one person with the strong handles on the sides of the cooler. It is also durable enough that it can be used as a stool or bench as well as a cutting board or table. The RTIC Cooler is called a “roto-cooler” because of its manufacturing design. It is considered rotationally molded, which is constructed to keep ice cool for a long time. The manufacturing design has thick walls that are free of flaws so it keeps out any unwanted paws and it is practically impossible to break. Because of its construction, ice and items in the cooler will last for up to one week and possibly even longer if the lid is not opened excessively. With its retro design, this cooler looks as cool as the food it keeps on the inside. This large cooler is a throwback to 1954, but with cooling capabilities that last long into the future. The cooler has a pair of stainless steel handles on the side, making it easy for one person to carry. The handles are covered in rubber to make them comfortable to hold, too. Once you arrived at your destination, you can use this durable cooler as a comfortable seat, too. This cooler is so big that it will hold 85 cans! When it comes time to drain and empty the cooler, you just open the drain hole and let the water leave. There is no need to tilt the cooler because of the leak-resistant and rust-proof channel drain. Then, you simply wipe down the interior and let it dry. Everything about this cooler is built to last. It has high quality metal hinges that will not snap off or break. The o-rings will also keep the warm air out and the coolness inside. It is a fabulous cooler that will last for several years and keep your food cool for a long time. In fact, it can keep a bag of ice inside for up to one week. No cooler review is complete without a Yeti option. This is the Cadillac of coolers and is a perfect choice for every situation that requires a cooler. You can use it for camping, fishing, a family BBQ, and more. The cooler holds up to 65 quarts and keeps everything inside cool due to its three inches of PermaFrost insulation. It also has a certified bear-resistant FatWall design from the rotomolded construction making the cooler practically indestructible. Yeti included its T-Rex latches to keep the lid securely in place. This cooler is 30 ½” x 17 ½” x 16 and weighs 29 pounds empty. It does come with a basket to keep dry goods inside, but away from the ice at the bottom. It isn’t unheard of for the Yeti Tundra to hold ice for over one week, especially when paired with a layer of dry ice. The design of the handles makes the cooler easy for two people to carry without fatigue. The large o-ring on the top keeps the cooler airtight so your food stays the perfect temperature for long periods of time. This durable cooler will outlast the elements. You can use it as a seat or a stool, too. While this cooler is perfect for every condition, it is best for people who really need a heavy-duty cooler because of terrain or weather conditions. As a bear-resistant roto-molded cooler, the Engel Eng65 is built to last. It will keep ice cold for up to 10 days and has been rated the best in class for its quality performance. The roto-molded cooler is surrounded by two inches of polyurethane insulation. The cooler has received the official IGBC certification for being bear resistant and it has been designed to be a tough and water-resistant as whitewater kayaks. The latches are marine-grade and the lid stays tightly in place due to the silicone gaskets. The cooler is ideal for any situation from camping, fishing, and hunting to fun days at the beach or the ballpark. But, it is designed to last in the most rugged terrain and the hottest weather conditions. It also includes handles that are long enough to make it easy for two people to carry. If you need to sit or stand on the cooler, the lid will stay in place and will not crack under pressure. It is a great choice for boating and rafting because of its water-tight design. The cooler has tight latches, but it also can be locked with its DuoLock Security Holes. If you need the lid to remain open, it is includes what Engel calls the Anvil Hinge. It can be easily tied down to keep the cooler from moving around your trunk or truck bed. It is easy to drain the cooler due to the one-twist Flick Drain plug. The non-marking feet do not leave marks, either. 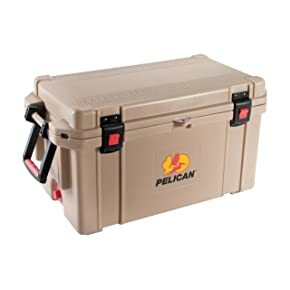 Pelican is known for making durable coolers that will last for a long time. This cooler is rated to keep ice cold for up to 10 days. The freezer-grade gasket and two inches of polyurethane insulation makes this a great choice for people who like to camp in the heat of the summer. The hinged handles are molded so they are comfortable to use while carrying the cooler with a partner. The latches stay nice and tight and cannot be opened by wilderness critter; but, you can open them – even if you are wearing gloves. The cooler can be easily drained with the gently sloped interior. It is also possible to attach the drain opening to a garden hose to move the water away. Pelican’s cooler is strong and durable, so you can use it as a seat or a stool. The lid has a measuring device so you can see how long your fish are. Even with the two inches of insulation, there is plenty of room on the inside to hold more than 60 cans as well as plenty of ice. The latches and other hardware are top quality and are built to last. It is a big cooler that does require two people to carry it. Pelican products are made in the USA. 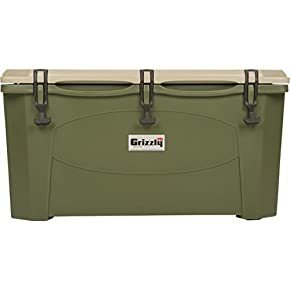 With capacity for 60 quarts, this Grizzly Cooler will withstand the elements and keep your food cool for several days. It is a durable cooler that will function as a seat or stool and it has three tough latches that keep the lid sealed. The two-inch diameter drain makes it easy to clean and empty. It as non-skid feet so it won’t roll around in the back of your truck. It has molded handles with nylon ropes that are comfortable and easy to carry with two people. It is lighter than other brands so it can be easier to carry and it is designed to outlast the elements – even the hottest days. This cooler has an embossed ruler on top so you can measure your catches and the rubber gasket keeps the cooler sealed so your catch will not spoil. The BearClaw latches keep unwanted claws and paws out. It comes with two-inch tie-down slots. It is rotomolded, made in the USA, and comes with a respectable warranty, too. When it comes to choosing the best cooler, brands can be the best way to finalize your decision. The traditional brands like Coleman and Igloo are always good choices. They have continued to make quality products with features that families, hunters, and anglers enjoy using. However, the newer players like Yeti, Pelican, and Grizzly are also good choices because of their updated and heavy-duty designs. The traditional brands tend to be more affordably priced that the newer brands because of the new manufacturing and high-tech features. Honestly, every single one of the coolers on our list are good choices. The Coleman and Igloo are good options for casual campers and for families that like to go to the beach or the ballpark for a day or two. Serious hunters and anglers appreciate the quality and durability of the Yeti and Pelican brands. It is best to choose a cooler that fits into your budget and has the capacity to hold everything that you want to bring with you. Selecting the best cooler can be difficult, because there are so many high quality options that come a wide price range. While the Coleman 54-quart cooler has been a favorite for decades, there are options that are more durable. The Yeti is a top option, but it can be hard for consumers to justify the price. 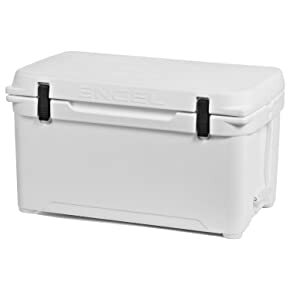 Therefore, the best choice on this list is the Engel High-Performance Cooler. This model is bear-proof and has features that are designed to outlast everything else on this list. Its marine-grade latches and outstanding silicone ring can keep food cool for days longer than the other options on this list. It is also extremely affordable, considering the quality and the features.